From iconic oyster bars to crab-shacks and coral reefs, London is awash (!) with great seafood restaurants with private rooms. Check out our top ten list below. 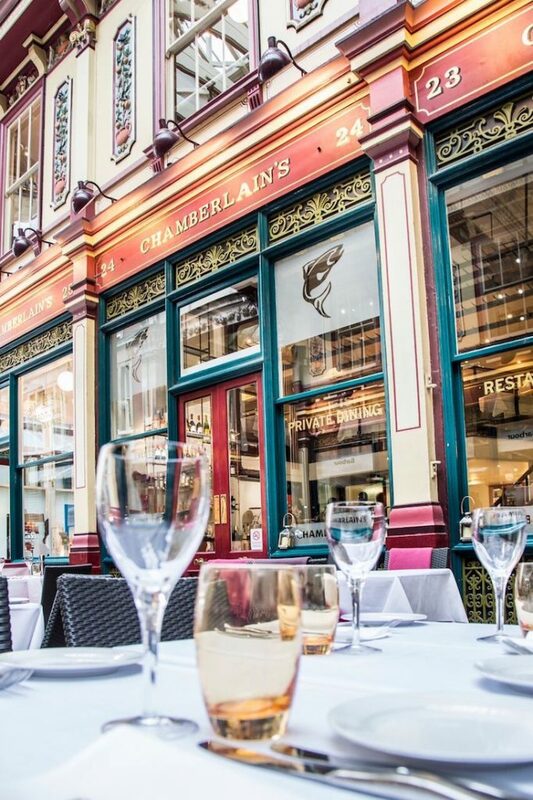 In the heart of The City, Chamberlain’s has been a seafood and fish institution in Leadenhall Market for the last 15 years. Supplied by Billingsgate Market, there are five different areas available for private hire, from the ground (16) and first floor (60), to the brasserie (35), the mezzanine (16) and the terrace (35) seated, while the entire venue can host events for up to 200. Canapé, set and brunch menus are all available with cost per hear estimated at around £50. We love this creative take on a private room – it feels a little like a lobster pot, surrounded by wrought iron metal. 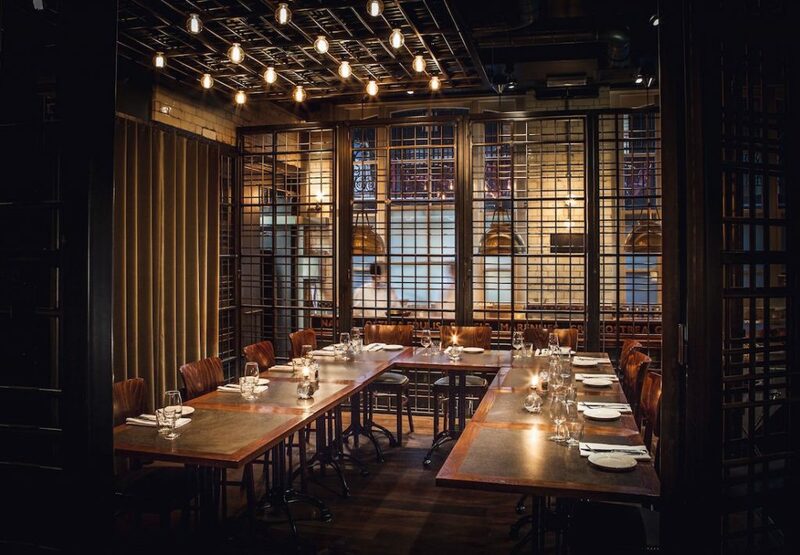 This buzzy venue on Kingly Street can seat up to 18 (30 standing) and comes with views of the kitchen pass as well as a TV screen… and of course fabulous seafood and oysters from Wright Bros. There’s a choice of £40/£50/£60 three course set menu options. Hidden in the Belgravia backstreet, this hotel restaurant has always inspired. Now hosting award-winning chef Nathan Outlaw’s fishy talents, there are two discrete private rooms: the Eaton Suite for 14 and the Cadogan for 24 as well as the option for exclusive use of the restaurant for parties of up to 34. Set menus start at around £60 per person, while five course tasting menus are available on request. This British fish and seafood institution was reopened by Midas-touch restaurateurs Caprice Holdings back in 2005 and has enjoyed a full-blown renaissance ever since. The stunning Art Deco inspired private room seats 40 or 50 for a standing reception and has two hidden plasma TV screens available on request. Set menus start at £58 per person, rising to £85, while the 5-course tasting menu with coffee & petit fours is £110 or £160 with paired wines. If you’ve got a private room called The Crustacea Room, you’ve got to live up to the name! With space for up to 14 guests, this intimate room is decorated with chef Richard Corrigan’s personal art collection and offers guests a reduced a la carte with complimentary canapés, tea, coffee and petit fours for £55 (lunch) or £72 (dinner). The Swallow Street Rooms offer two separate rooms which can also be combined to host up 6o guests (seated) or 100 for standing receptions as well as its own private bar, late license, piano and top notch sound system. Three course menus here start from £40 per person and also include canapés, tea, coffee and petit fours. There’s no room hire for either venue. The Martin Brudnizki designed Coral Reef Room offers space for 48 guests seated or 60 for a standing reception. With its own bar and two massive live coral reef tanks, the ambience is almost immersive. Private dining menus are fish and seafood oriented and take inspiration from the Asian sea and Japan, offering guests sharing style or tasting style options. Lunch menus start from £55, and dinner is from £65. These old family oyster purveyors are at it again with this fabulous restaurant in the heart of Old Spitalfields Market. With a stunning oyster bar, the heated (and fully covered!) 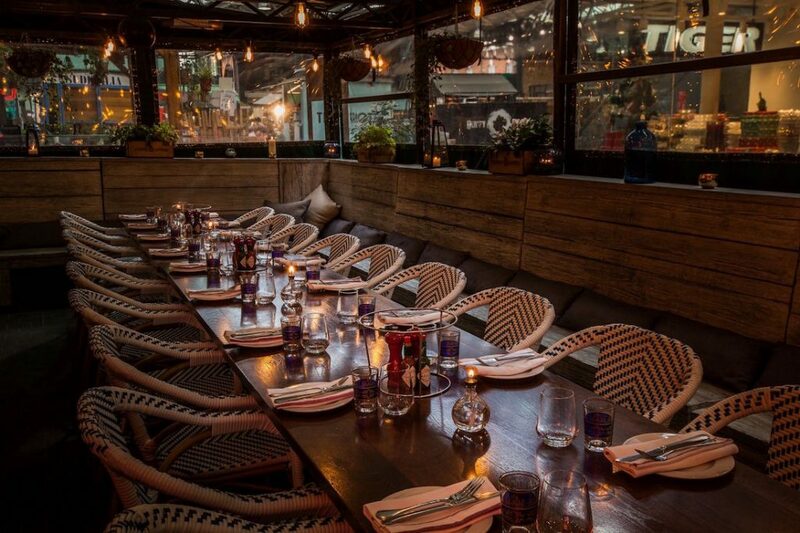 outdoor terrace is a fabulous space for private functions, seating up to 30 or 40 for a standing reception. With a range of set menus from £39, £49 and £69, they also offer wine pairings, deluxe planners of fruits de mer and even have meat and vegetarian options available just in case. A stone’s throw from Smithfield Market, this was Mark Hix’s first solo restaurant way back in 2008. With a marble oyster bar, wooden floors and tiled walls, it embodies everything Hix has become renowned for over the last decade. Great food, simply prepared. Parties of up to 32 can take semi-private areas in the restaurant and feast on set menus that start at £37.50 but also include the gourmet blow-out oyster and chop feast menu at £70 per person. The whole venue can also be hired exclusively for up to 100 guests. Our top tip is Happy Hour oysters every day 4-7pm £1.25 each or Half a dozen and a glass of Hambledon Classic Cuvee £15. Not to be missed! For fabulously fun BBQ pit and Crab-shack experience, check out the Big Easy’s striking venue at Crossrail by Canary Wharf. A huge venue with multiple options for private and semi-private dining The Captain’s Table for 24 guests, is a real Jack Sparrow-inspired affair, with menus offering surf n’ turf options at all levels from £20 – £65 per person. Not to be missed are the alcoholic cocktail slushies and also the Rum Lounge for up to 100 which has live music every night. There’s no room hire but minimum spends do apply. Located on the ground floor the Oyster Bar is a relaxed, open dining space that’s often used for drinks receptions and seated group events in the two main dining areas: the Main Foyer (60 seated) and the outside terrace (30 seated). The emphasis is on traditional brasserie style cooking and family-style sharing platters. Available for breakfast, brunch, lunch and dinner, it’s also used for wine tastings, canapé receptions, product launches and oyster shucking – of course. The Michelin starred Claude Bosi at Bibendum on the 1st floor can also be hired exclusively for up to 70 guests for a seated reception. Prices for both venues are based on minimum spend and bespoke packages are created for each client.